Tired of repeatedly tapping your street address, your job title, or common phrases like “on my way” or “you there?” on your iPhone or Android phone? If so, good news. 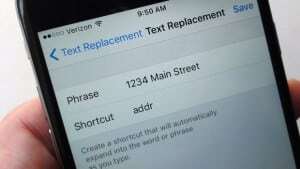 Both iOS and Android devices will let you create your own, custom keyboard shortcuts for … well, just about anything. Once you’ve tweaked the right settings, you can ask “you there?” in a text message by simply tapping, say, “yt”. You could also conjure your street address, your official title, or a phone number in just a few keystrokes. 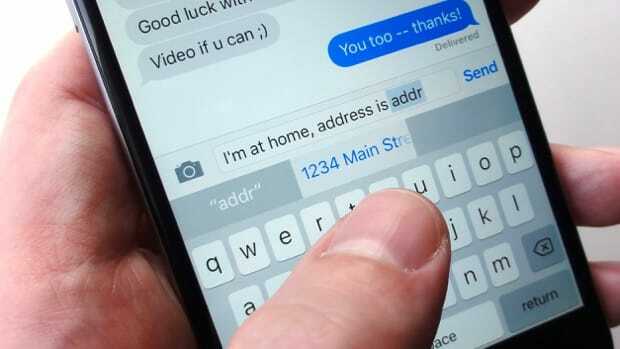 Just type your new keyboard shortcut on your iPhone and the full phrase will appear just above the keypad. Tap the “Save” button. All done! Let’s give our new shortcut a try. Go to Messages, compose a new message, and tap “ut.” Your new “You there?” shortcut should appear in the strip of auto-correct suggestions along the top of the keypad. Press the space bar or a punctuation mark to accept. 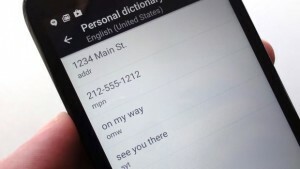 You can add custom keyboard shortcuts to your Android device’s Personal Dictionary. Tap the “+” sign in the top-right corner of the screen, then enter the word or phrase (like “on my way”) you’d like to make a shortcut for. Tap the Back key, and you’ll see an entry for the shortcut you just added. Want to add more shortcuts? Tap the “+” sign again. Now, go to, say, the Gmail app, compose a new message, and tap one of your new shortcuts—and when you do, the phrase you entered will appear in the row of auto-correct options just above the keyboard. Tap the phrase to add it to your message. Click here for more Android tips, or click here for more help with your iPhone or iPad!